Watching Tommy Wiseau in a film always feels like an out-of-body experience. He's never in character, he's always just playing himself, phasing into every scene as if he has just arrived from a different dimension. What should be just normal interactions between characters turn into surreal fever dreams with Wiseau babbling on and the other actors struggling to keep up with him (or not laugh). 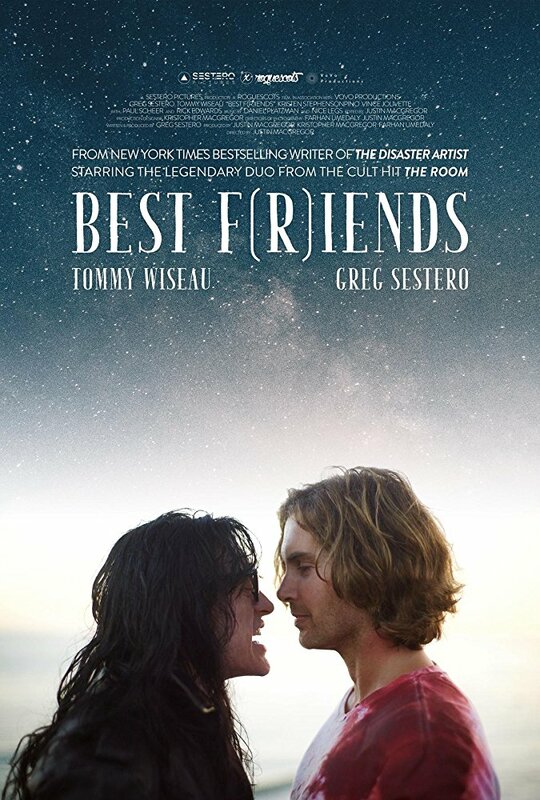 In Best F(r)iends (2018) Wiseau and Greg Sestero reunite on screen for the first time since The Room (2003). Sestero plays a homeless drifter named Jon who gets befriended by Harvey Lewis (Tommy Wiseau), a quirky mortician with a penchant for collecting the teeth from the cadavers in his care. Jon discovers that Harvey has been saving all the gold from the teeth (in a box with the words "mouth stuff" hastily scrawled on it) and secretly starts selling it on the dental black market. Harvey gets in on the scheme and the copious amount of teeth money coming in threatens to break their precious friendship apart. Let's get this out of the way: this movie isn't "good" by the normal definition of the word. It is, however, extremely entertaining and often hilarious. The general aesthetic of the film is teetering on art house with oddly composed shots of random objects and jaunts into Terrence Malick territory with long spinning shots of scenery and rotating night skies lit up with glittering stars. This has the effect of causing some serious cognitive dissonance when Wiseau is juxtaposed with artistic mise-en-scene. It's impossible for him to feel like a cohesive part of any film he is in, which to be honest, is part of the allure of watching him act. The movie happens around and in spite of Wiseau. The score for the film, by Daniel Platzman of the band Imagine Dragons, is great and has some fantastic electronic riffs. I don't know if it was just the sound system at the theater I was at, but the music had a tendency to drown out some of the dialogue during several scenes (which might be a good thing depending on your perspective). Like The Room, the showing of Best F(r)iends I attended had a lot of audience participation which is one of the fun things about going to these kinds of movies. Watching Tommy Wiseau is a communal experience in which you commiserate with your fellow audience members and reassure each other that what you saw actually happened. When the film concluded everyone was clapping and cheering. I made friends with the people sitting next to me and we vowed to meet again to watch the second half of the movie (yes, this only part one). I think that bringing people together in laughter is Wiseau's greatest contribution to society.